The Amazon Marketplace - Serving as Disruptor or Predator? It's rare for a day to go by without Amazon being in the news as their initiatives continue to irreversibly change the face of the consumer's shopping behavior. The outlook for traditional brick and mortar retailers has been systemically challenged with many different verticals under attack. Furthermore, less visible, but equally disruptive, is the impact on the entire value chain (suppliers and competitors) that supports and surrounds the national brand retailers. On August 10, 2017, Office Depot released their Q2 2017 financials, missing Wall Street expectations, and causing their share price to fall to $4.40, down 30% from its 52-week high. During the subsequent management review, one of the reasons provided for the earnings miss was put down to the escalating threat from Amazon. Speculation continues about the future of Office Depot, with rumors even spreading that Amazon themselves may be interested. Meantime Staples, with five consecutive years of declining top line (-25%) and earnings (-32%) announced they're going private in a $6.9B deal with PE firm Sycamore Partners. Although pre-privatization, Staples has a healthy balance sheet (about $1B in debt), post-privatization that will deteriorate as a significant part of the acquisition cost becomes debt. In these turbulent and challenging times, a weaker balance sheet will not help management navigate their way through the industry headwinds. Everyone is trying to protect their turf in a mature, moderately declining industry that still has around $200 billion in annual U.S. retail sales and $200 billion in current global market capitalization. Wholesalers (SPR & Essendant) are struggling - what will their next step be? Chinese manufacturers - aggressive pricing to win market share - but, they don't have volume because they don't have distribution - so, they go to Amazon! Resellers looking for salvation in the Amazon Marketplace are, in fact, delivering the office products industry on a plate, while they pay Amazon's customer acquisition cost (via merchant fees) for the privilege of doing so. And, the real kicker, most merchants (resellers) are not making any money as they do so! 85%+ of purchases are made from the Buy-Box. Amazon controls who appears in the Buy-Box. Average revenue per customer is low. Cost of customer acquisition is high. These key performance indicators are not consistent with a sustainable business model. As Office Products resellers in the Marketplace try to get more business, they know they have to get into the Buy-Box more often. However, to get in the Buy-Box means (mostly) lower prices are required. Amazon is a disruptor but, they're achieving their market share and category objectives using discreet, predatory tactics only possible because of the powerful platform they've built and the dominant web traffic position they've established. However, once they achieve their objectives and control the market now being delivered to them, who, for one moment, thinks prices will stay as low as they have been driven? This disruption is, unequivocally, not in the long-term interests of the end-consumers because, once Amazon has control, prices will increase and the merchants, who delivered the industry, will go out of business. Amazon, as a disruptor, is driving change and, because of the increasing threat, companies are finally beginning to respond. So, in the future, it's not likely to be just Amazon that the "currently threatened" office products resellers will be complaining about. It will be a community of additional companies that got off their collective backsides and implemented measures to counter the threat. Those office products resellers still dallying around today must decide whether to be part of the competitive response or not. Walmart, Best Buy, Target, Costco, Sam's - they're all finally waking up and rolling out strategies to protect their business models. Remember, to position themselves to compete with Amazon, they are forced to get better at what they do. Then, the better they get, the more of a threat they will also become to the remaining office products resellers who fail to invest to transform their businesses. If Amazon hadn't come on the scene, then the pace of change would be much slower and the "rent" extracted from consumers at different points in the value chain, would survive longer. In this respect, Amazon's emergence has been a good thing because it was important to disrupt some of the cozy arrangements of the pre-Amazon world. However, the competitive reaction has been slow, so people are starting to fear Amazon's head-start will soon put everyone else out of business. As the office products resellers battle for survival becomes increasingly desperate then, eventually, as more and more wake up to the threat, no stone will be left unturned as resellers seek out options. In these circumstances, it should be expected that more radical strategy decisions, perhaps unthinkable in the past, will start to take place! The ink and toner segment of the office products industry, around $25B of the estimated $200B annual U.S. retail dollar spend, may become the pivotal category in this fight for survival. 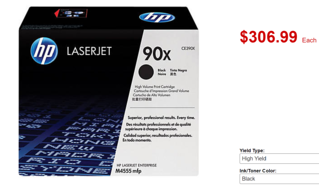 Ninety-percent of the $25B annual retail dollars for ink and toner cartridges are spent collectively on high-priced, OEM brand cartridges and remanufactured cartridges discreetly available through the "big-box" resellers. 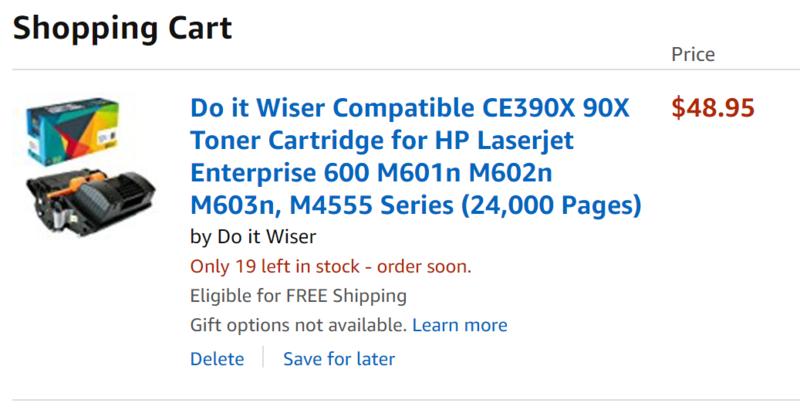 Meantime, there's a free-for-all taking place in the Amazon marketplace, with new-build offshore cartridges being sold at prices 80-90% lower than the price of equivalent OEM brand cartridges. Over the last 25+ years, there has been tremendous loyalty from office products resellers to the OEMs branded cartridges with OEM market share, at 80% or so, mostly unchanged. However, the new competitive environment means we should no longer be surprised to finally see a rapid adoption of "new-build" aftermarket (offshore) compatibles through the big-box channels. But, for this strategic shift to succeed, it must be accompanied by skillful, and aggressive, reseller tactics that professionally convert customers from OEM brands to their private label products where, not only can they save consumers money, they can also make substantial profits. The consequence of this action will be to accelerate the OEMs defensive strategy which, ultimately, may eliminate the reseller from the value chain as they sell more and more products directly to the consumer. A major event if it takes place, but, the OEMs ink and toner cartridges generate profits vital to their business model which they simply cannot afford to lose. Amazon has opened Pandora's Box - it cannot be closed, so now we must hold on for the ride! Business survival in the future is about technology supporting efficiency, supporting service, and supporting the provision of a compelling value proposition. Local resellers, who are able to combine this technology capability with personal customer service, may then eventually turn the tables as they develop a competitive advantage the Amazon machine will ultimately be forced to figure out a way to deal with.